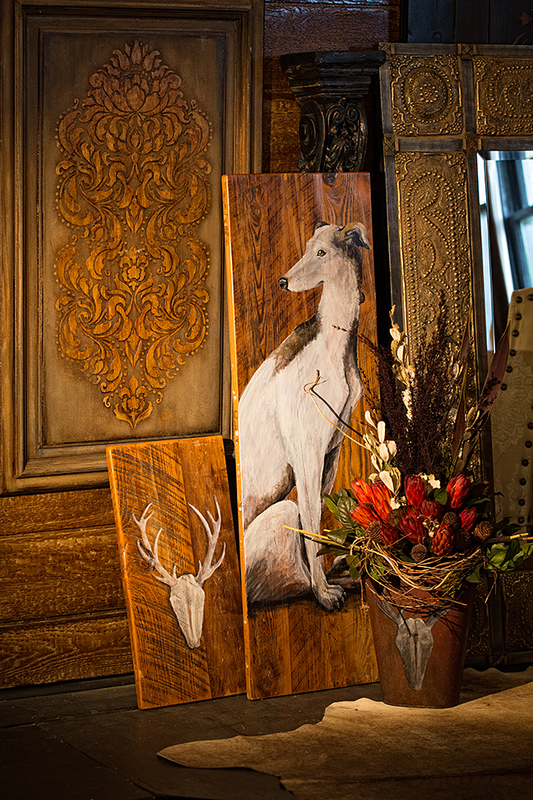 Nettie White and her team of artisans transform spaces -- and the fixtures within their walls -- in truly inspired ways. Cortney Turner, Sondra Turner, Steve Frey, Debra Brading, Jessie Street and Nettie White. Photography courtesy of Tom Chlebowski, That One Summer. Cortney Turner, Jessie Street and Sondra Turner. Nettie White’s stock in trade is transformation: designing high-end, custom artistic spaces that breath new life into just about everything in your home. 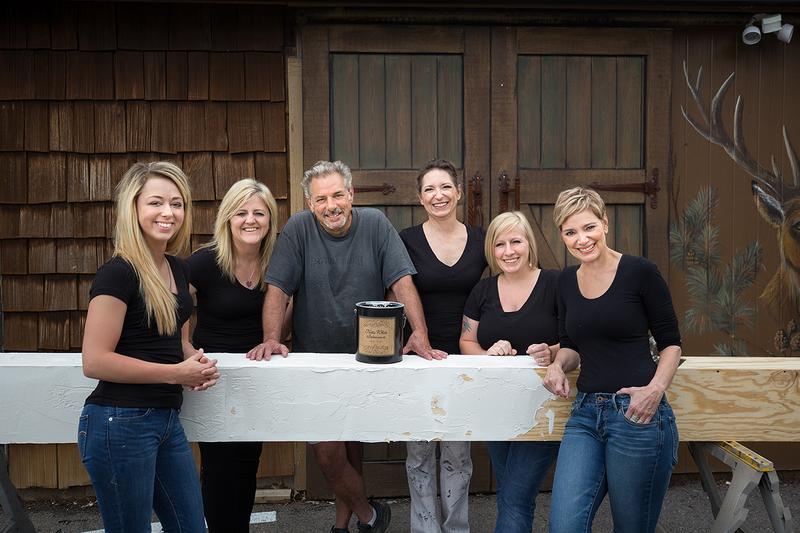 Nettie eventually teamed with a general contractor with a creative eye and in the 16 years since starting her business has added seven more artisans to her team, each with a specific skill set and each cross-trained in multiple disciplines. Together, they can take a “Summer of Love”-era kitchen with dated olive drab and metal to a warm and timeless castle-like space, complete with custom-antiqued cabinetry, charming distressed wood furnishings, warm stone backsplashes and countertops, faux leather surfaces and elegant wood ceiling beams. Nettie’s boutique style is seamlessly tied into the décor her clients already own without gutting the room. Want to replace narrow-strip wood flooring with wider boards? 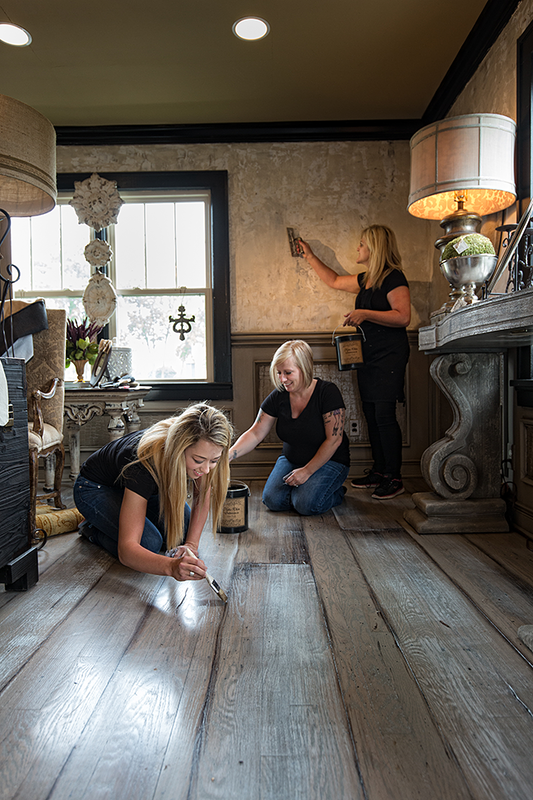 Nettie’s team has perfected sanding, staining and routing techniques to create the illusion of wide-plank floors without tearing out a single piece of wood. 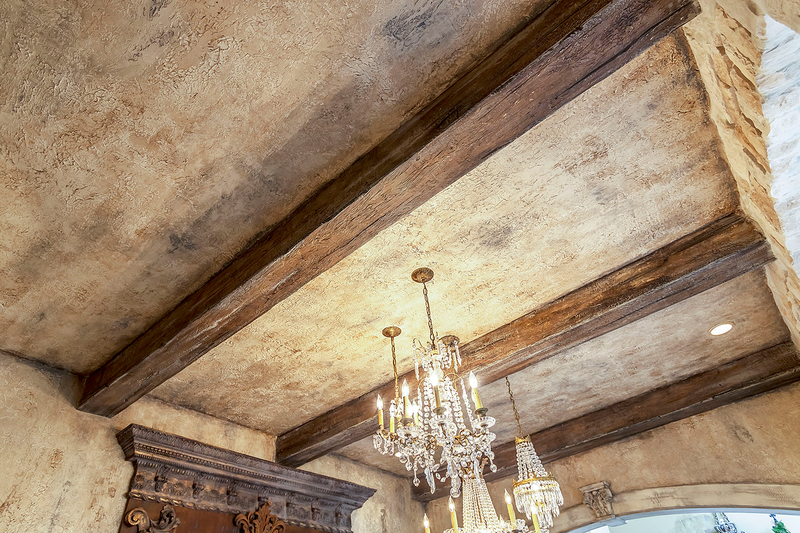 This artistic approach to surface finishing not only results in masterfully reimagined spaces, but also is far less disruptive to her clients. Where total ripping out and replacement of walls, floors, furnishings and décor can drag on for months, she and her team can be in and out in a matter of weeks. Life in the home can go on more-or-less as usual, and the homeowner is spared the pain of manufactured pieces that don’t fit his or her personality and aesthetic. Those who aren’t yet in the market for a redesign can still zhuzh-up a room with a piece or two from her Wildwood lifestyle boutique, The Porch. The shop includes a revolving selection of signature hand-painted furniture by Nettie and other artisans, and is the ideal place for would-be clients to preview furnishing styles and pre-plan a project.